The ebook in PDF "THE IMMORTALS" is the revelation of the cathar immortals of the castle "San Salvador True" to Blessed John of the Holy Grail. 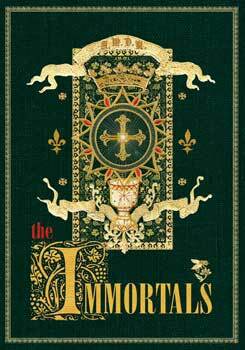 The Immortals, as the highest rank of the Cathar Great Church of Love, reveal themselves and explain the foundations of their unique spirituality in this book, and invite the reader to inherit their treasury. From the book "THE IMMORTALS"
A new God for a new humanity. Recognize the greatness of what is happening: the Sun of suns, revealing Himself for the first time to the sunny Theohumanity. The revelation is given for salvation in the Ark and is intended for a few of the inhabitants of the future age, the Seraphites. The Father of purest light and pure love will become the Divinity of the sunny people. 2000 years ago humanity missed the opportunity to change (the Christ of the Jerusalem period). The Chalice of Christ’s blood concealed itself for two thousand years. And now – it is transforming like the fiery fountain of 200 million answering last drops! Christ’s kingdom is made up of those, who have given for Him the answering last drop, which is called Christ’s fiery drop of regeneration, the extract of eternal life. With this last drop, each of the 200 million martyrs of love freed the divine essence, hidden in the Adamite potential. Deiparous vestments, virginity, holiness and the Great Church of love were required to shed the last drop into the solar Grail of Christ. Become apostles of the great Holy Passion, Eucha ristmen of the answering last drop, Melchizedeks in the image of the High Priest Melchizedek and the Agnus Dei of Christ. In vain we tried to insert ever-burning candles into the hearts of the Adamites. The cunning one enslaved them, and our attempts remained fruitless. Seraphim succeeded in the Gulag: for unities. The Blessed myrrh-pouring Euphrosinia succeeded: for the church of John, her disciple. Do not pin Our Father to Adamite wretchedness. Believe in the Divinity of divinities of the transforming Christ-III.3 Accompany faith (= the retention of the sphere) with confidence in purifying disasters (1), mysterious sights (2), and the miraculous salvation (3) of those, who listen and love. The forms of the old (Adamite) faith end up as antiques in the best case or on the rubbish dump in the worst (the biblical idol). The Father-Sun reveals Himself for the first time and has no analogues in the 84th civilization. Do not compare, do not contrast, do not make artificial clothing for yourself. Do not pin ‘new patches to an old garment’, becoming like the Jews of the Old Testament. Keep the courage of the pioneers and fearlessly profess the coming of the era of the Sunny Divinity. John the Theologian saw it on Patmos, in the form of the Wife Clothed in the Sun. Inflame hearts with a passionate faith in the rising sun of the Divinity! the Lord’s summer, the morning before the dawn! O John, pure among the pure, our brother! From the beginning of your witness on Earth you were not understood by the Christians, because you professed our Christ and believed in our Father. In the Gospels and even in the Jewish Torah you perceived the Father-Sun, proclaimed by you overworldly the Solar divinity, embodied in 200 million Christs great and small. Your 400 (= 400 000!) books are a hymn to our Father, the Sun of suns of pure love. Now they will hear! And the deaf… Our Father will remain deaf to their requests. Agonizing sobriety awaits them, as severe as their obstinacy in rejecting our Father. There is only one true Divinity in the heavens and on Earth: the Father-Sun, the Father of pure love. The others are chimeras, adopted and mastered by demonic hierarchies with the goal of disorienting man. Our sweetest Father, glorified by millions of sunny hierarchies, by millions of celestial sunny bodies great and small, by millions of transformed sunny beings (who have never yet descended to the Earth), will descend in glory with the solar Church of overworldly Tabor and establish the kingdom of the sunny man (homo solaris). Man will be transformed by faith into the sunny Christ of pure love, Christ-III. The Gospel of the sun is proclaimed today. Today it is easier than ever before to enter the sunny ark, to be transformed with one touch of the sunny right hand of Our Divinity. O Divinity of purest lights! The homeland of sunny fathers and mothers! The time of assembling in the ark. The universal preaching. Advise those, who have been deceived, to abandon biblical fairy tales and absurd prejudices. Tomorrow they will remember about the day of the universal preaching with great grief. Tomorrow may be too late. I hear the apocalyptic alarm bell, accompanied by the words ‘Too late, too late, too late!’. The pioneers should have the courage to abandon their Christian prejudices, like the Christians abandoned the Jewish circumcisions, sabbaths and meticulous instructions.